Here’s another beauty post (finally!). Rihanna has been working with UK make-up artist Karin Darnell for her festival tour. We all know that Rihanna loves a red lip. 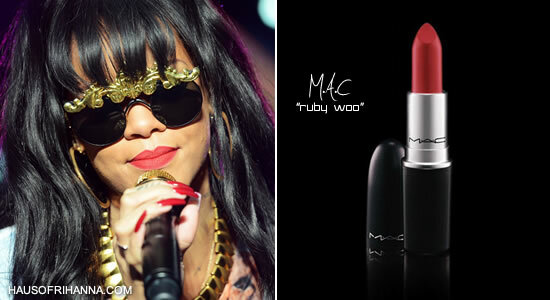 For Rih’s appearance at Hackney Weekend Festival Karin used MAC‘s Ruby Woo, which is one of the brand’s most beloved red lipsticks. Karin went a bit darker than Rih usually does for her appearance at Sweden’s Peace & Love festival. Karin used a lipstick from Nicola Roberts’ make-up collection, Dainty Doll. She used the 001 Couture lipstick on Rihanna for the event. ‘It was a street Egyptian-inspired look, but more fashion than Egyptian!’ Darnell told us. To get that Egyptian feel, Darnell applied a double liquid line underneath and on top of the eyes. To avoid it looking too retro, Darnell ‘painted straighter lines on Rihanna’s eyelids, rather than an upward sweep’. Rihanna’s foundation was Dolce & Gabbana, while the powder Darnell used on top was by Iman; on cheeks there was a subtle blend of bronzer and peachy blush by Givenchy.